Thule have upgraded all aspects of the ProRide 591 with the ProRide 598, taking it to the next level of ease-of-use and safety. Available in Aluminium or Black, this will be the new standard in roof-mounted cycle carriers. Suitable for almost all types of bike up to 20kg in weight, including bikes with disc brakes. Automatically positions your bike when you secure it with the uniquely designed frame holder and wheel tray. Large soft pads in the frame holder claw adapt to your bike's frame tubes to minimize the risk of frame damage; a torque limiter dial controls the force going into the bike frame with a clear sign of correct mounting, further preventing any bike damage. The claw’s extended lower jaw also helps to prevent your bike from falling whilst loading and un-loading. 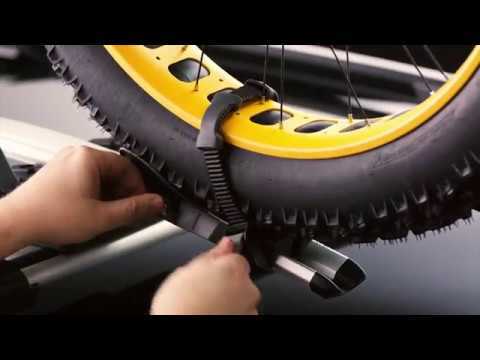 The smartly designed wheel holders keep the bike wheels as securely in place during transport; diagonal quick-release wheel straps are easy to use and cover as much of the wheel as possible for further support. The ProRide 598 can be easily configured for switching the carrier from one side of your car roof to the other by reversing the frame and wheel holders, for extra loading ease and convenience. Like all Thule cycle carriers, the ProRide 598 fulfils the latest City Crash norms and is fully TUV approved.